Despite the presence of Peter O’Toole, Joan Plowright and Alicia Silverstone this dopey little film is sort of a dopey little film. I watched it initially because I found it in a $5 bargain bin, but it has a sort of innocent charm. 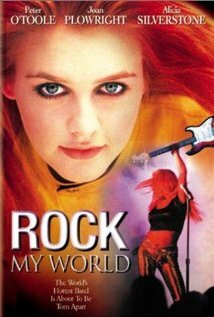 Alicia Silverstone’s character is the replacement bass player in a band that broke big and then their bass player disappeared. She’s trying to find her place in a band while all the other members are freaking out because their main song writer has vanished. They have retreated to a British estate to get it together, but there’s a sly record exec trying to get them to sign a damaging contract. The owners of the estate were renting the place out because they’re in dire financial straits, but the temporary help they hired to take care of the band falls through leaving them the option of admitting the problem, losing income and having all their upper crust friends find out OR pretending to be the staff themselves. It’s a movie, what do you think they did? So what you have is a tense, dramatic story of an entire band’s character arc happening in the middle of a slapstick British comedy. Neither angle really gets off the ground, but it’s charming in its own way and not a bad afternoon.